Prepare to be dazzled when you sail your dream beach vacation into harbor at the Pier Watch Villas II, a resort condominium complex in North Myrtle Beach, South Carolina! 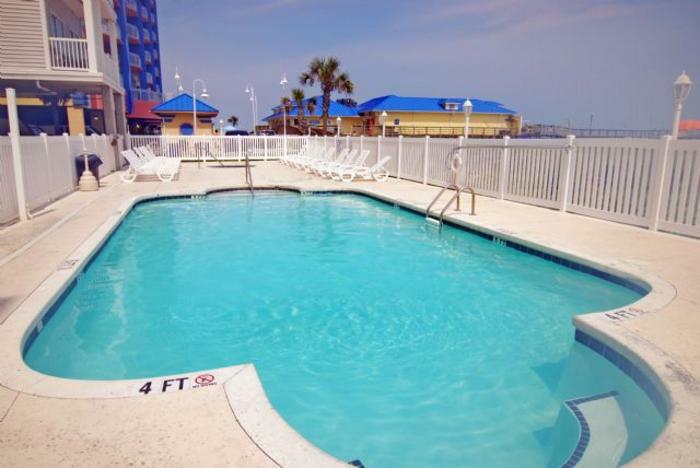 Set in the lovely Cherry Grove section of North Myrtle Beach, this four-story rental resort is dripping with amenities. The beautiful light exterior of the condo complex exudes the luxury beach life to the last detail, studded by South Carolina palmettos and luscious landscaping. With a covered parking area, even your vehicle will enjoy this resort! The Pier Watch Villas II resort features attractively furnished condos filled with fine furnishings, a beachy ambiance, and every comfort of home. Take a leisurely exploration walk about this aesthetic resort, discovering all the reasons you will not regret choosing to spend your vacation here. A sparkling blue outdoor pool and relaxing hot tub and easy beach access are just a few of the perks of staying at Pier Watch Villas II. Gorgeous rental condos include well-equipped kitchens and generous balconies that offer views of the stunning Atlantic Ocean. In North Myrtle Beach, South Carolina, your time is your own to invest how you please. Spend hours swimming laps or splashing around in the pool, or take a short walk across the street to enjoy the white sandy beach and shimmering ocean waves. Your Pier Watch Villas II rental condo puts within easy reach all of the best North Myrtle Beach has to offer. The area is brimming with restaurants, attractions, shopping, water sport rentals, fishing expeditions, golf courses - the list goes on and on! For every taste, there is something to satisfy. Fishing enthusiasts will enjoy the nearby Cherry Grove Pier, as well as the numerous fishing charters and deep-sea expeditions. Aside from playing in the sand and ocean, kids will no doubt be drawn to the local wildlife experiences, amusement parks, arcades, and the popular Myrtle Beach Boardwalk. Get your fill of thrills by attempting jet skiing, parasailing, Flyboarding, even sky diving! And with over 1,000 restaurants and eateries in this area of South Carolina, indulge yourself in a culinary paradise! Pier Watch Villas II will swathe you in luxury while offering you a comforting home away from home as you and your family and friends escape from the stresses and worries of the everyday craziness of life. Feel the warm South Carolina sun soothe your skin, breathe in the healing seaside breezes, and immerse yourself in the spectacular ocean views. Pause, relax, and take off your shoes. Then don some flip flops or a set of water skis and never look back! You have arrived at your North Myrtle Beach vacation. Elliott Beach Rentals is not affiliated with onsite management or the HOA of Pier Watch Villas Ii.